This year Global Handwashing Day takes place on 15th October and Kimberly-Clark Professional is embracing the annual event’s theme ‘Clean Hands – a recipe for health’ by supporting FMs with a range of tools to help them champion hand hygiene, health and wellbeing in the workplace in relation to snacking and eating. Kimberly-Clark Professional has created a special Scott Clean toolkit for Global Handwashing Day which will provide facilities managers with everything they need to engage their guests and employees on 15th October to enhance hand hygiene and maximise infection prevention. 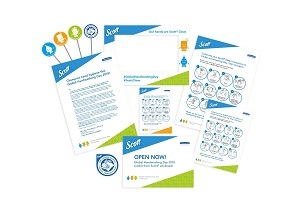 The Scott Clean toolkit includes hand hygiene posters and washroom mirror stickers to display in and around the workplace. Plus, to encourage maximum employee participation on the day itself, there are healthy snacks and hand hygiene postcards to hand out, plus a selfie photo frame and Global Handwashing Day themed novelties. There’s also a Scott Clean eToolkit available for facilities managers who want to spread the word via their company’s online channels like email, social media, website, intranet and digital signage. Stanley continued: “We’ve designed the Scott Clean toolkit to help Facilities Managers and employers show they really care for their guests and employees by promoting Scott single use paper hand towels and foam hand cleansers in the washroom as an essential step before every meal or snack. We want this initiative to celebrate Facilities Managers for choosing Scott and to positively impact employee health and wellbeing in the workplace. Free Scott Clean Global Handwashing Day toolkits may be obtained by visiting: https://www.kcprofessional.co.uk/ghd2018.